Do you know how the part or system works? Here are some things to consider when repairing or trouble-shooting your next problem. Most people would not argue that having some automotive knowledge and training in repairing vehicles is required to do just about any repair or to trouble-shoot a specific problem on today's vehicles. But how much training is required? Well, as you can imagine, it varies with the difficulty level of the repair job you are attempting. Doing an oil change is something that most people attempt as their first repair. This procedure seems soooo easy for people who has been changing their own oil for years. But even this seemingly simple procedure requires some training if to be completed correctly. What specific grade or type of oil is required for my engine at this time of the year with temperatures in the 30F range? 70F? How many quarts "exactly" does it take to refill the engine to the correct level? Over filling an engine with oil, can be just as damaging as under filling. What items need to be removed to gain access to the drain plug and oil filter? What specific oil filter part number do I need to use? Generally speaking each engine type requires a different oil filter. How tight should the oil filter be torqued? Tighten by hand until snug? 3/4 turn after gasket contact? Torque to 18 ft lbs? What about the torque on the oil drain plug? Do I need to purchase a new sealing washer for the drain plug? What about making sure the old oil filter rubber seal did not stick to the flange, which could cause a massive oil leak when the new filter/seal is installed over the top of the old one? What about the danger from receiving burns is you touch the exhaust system while underneath the car? Or maybe getting burned from the hot oil coming out of the engine? How about using caution when loosening the drain plug so you don't bash your knuckles against the sharp frame? What about the safe procedure for jacking up and supporting the car? Reading the owners manual and getting a quality repair manual is the first step if you want to become familiar with your vehicles systems. 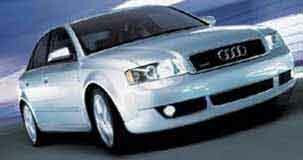 Factory Service Training publications are also available for your Audi. Go to the Technical Literature page for information on repair manuals and other service training materials available for Audis. Many local community colleges or other private facilities provide basic automotive training during the evening if you are interested in learning more about how your vehicle systems operate. They also offer training on doing specific preventative maintenance (oil changes, tune ups etc) so that eventually you can be doing your own vehicle repairs. For people looking for a career in Automotive Repair, there are schools located across the US that offer training through paid tuition. GM sponsors the ASEP program through many community colleges which combines college training, automotive training, and work experience for the next generation Technician. Most Dealerships offer training to their technicians as a requirement by the vehicle manufacturer and require ASE (Automotive Service Excellence) certification in the many areas of Automotive Service and Repair. Go to the Automotive Service Excellence Web site for details. Many aftermarket and OEM parts companies (Bosch etc.) offer their own training classes at local Hotel/Motel/Convention centers for free or a small fee. Of course there are many books available for learn about Automotive Design, System Operation and Repair. Go to Technical Literature page for more information. Ah.......Tools........I love to buy tools..............and this is a good thing, because they can be expensive and repairing today's vehicles for a professional mechanic/Technician requires investing anywhere from $10,000 to $50,000 in hand tools. More and more "special" tools are required as well as a plethora of electronic diagnostic tools. Digital Multi-Meters, Hand Held Scan Tools, Digital Oscilloscopes, and portable exhaust analyzers have become a requirement for most repair shops and in many cases for an expert mechanics tool box. Go to Test Equipment page for details on this type of equipment. Having the correct tool for the repair or trouble-shooting job you are performing is critical to having good success. If you are just starting out, purchasing a "Mechanics Tool Set" from Sears or from some other brand is a good place to start and will provide some basic hand tools. These sets often come with 1/4 inch, 3/8 inch, 1/2 inch drive Metric Sockets, Drive Ratchets, Open, Box, or Combination wrenches, Screw drivers, Allen Wrenches, Pliers, wire cutters etc. 1/4 drive flex head sockets, 10mm, 12mm, 13mm, and a long 18-24 inch long extension, can make getting into tight spots very helpful. 3/8 drive Impact flex head metric sockets and a 2-3 foot long 3/8 inch extension are also very useful for getting into tight spots. 1/4 inch and 3/8 drive allen wrench sockets, 4mm through 13 mm are useful for working on the Audis. Some of the Audi drive axles use triple square type bits of various sizes. Snap On, Mac Tools, and Cornwell Tool Trucks carry profession Mechanics hand tools, which are great, but watch out for the price as they are designed to last under every day abuse. YOU CAN NEVER OWN TOO MANY TOOLS! When doing a repair procedure, or when trouble-shooting a problem, "Experience" often can be much more import than any other aspect of vehicle repair. When you work full time, 40-60 hours a week, for several years as a professional mechanic or technician, you get REALLY good at doing many aspects of vehicle repair. If you specialize on one make of vehicles, and work at a dealership or a specialized independent shop, eventually you know these particular vehicles inside and out. You see the same problems coming in day after day, week after week, year after year. You can diagnose problems in the parking lot without ever having driven the car or even opened up the hood. This skill would amaze my friends or customers when I could tell them exactly what was wrong with their car, just by listening to their description of the symptoms. You also get very fast at completing specific repair tasks. Much of it is repetition, doing the same repair over and over again, you tend to find lots of shortcuts to speed up the procedure. Doing hundreds and thousands of valve adjustments, oil changes, tune ups, head gasket replacements, brake jobs, etc. gives you lots of exposure. Trouble-shooting odd ball problems specific to one model/make vehicle requires very little time, ONCE you have found the problem before and can remember what was occurring. The first time you trouble-shoot these odd ball problems, can be very painful, as you spend hours and hours, to track it down. The factory Technical Service Bulletins, (TSB's) are EXTREMELY important in this respect. They are compiled by the factory after getting feedback from the field repairs being done by technicians at hundreds and thousands of vehicle dealerships. Do you know how the system works? Most people would consider it foolish to try and fix a system on your car, if you didn't know exactly how the system works, but very often this sort of repair method is attempted over and over again. Many mechanics or technicians, just guess and start replacing parts that may or may not fix the problem. They call this the "shot gun" method of automotive repair. Now don't get me wrong, in many cases when a mechanic or technician has years of experience on one model of car, they may know which part is bad without even opening up the hood just by listening to the symptoms. In all the other cases where something is no longer working, and you need to do some real trouble-shooting, understanding how the system works will ensure you can solve the problem and find the solution. Many of the automotive repair manuals have trouble-shooting "trees" which branch out to test various items, and if one item tests ok, then you go to the next branch and test something else, it that part is ok, then you go to the next branch and so on. The only problem with these trouble-shooting trees, is that if you don't know how the system works in the first place, you may get to the end of the tree branches, and still not know why the system isn't working. You may also end up replacing some expensive electronic module that has nothing wrong with it. A friend who worked as an Automotive Training Instructor for many years, and who was rated as the top instructor in the United States, called these trouble-shooting trees, "Feed the Monkey" trees, as many people using them, did not know how the system worked that they were trouble-shooting and were just blindly jumping from limb to limb. It goes without saying that a mechanic or technician who understands how a system works, will always beat out a shot gun replacement mechanic or so called "Monkey" when some tough trouble-shooting is required. The Bosch publications, have this sort of "theory of operation" info and go a long way to understanding how each system in your Audi functions. Go to the Bosch technical literature section for a listing of available publications. Another very import aspect of successful vehicle repair, is the Vehicles Repair History. If the vehicle is having a problem, knowing what was done to the vehicle previously, can be VERY important to tracking down problems. Often times a previous repair may have removed a component during the repair that is now having problems. In some cases during the trouble-shooting of other electrical problems, some components or electrical connections may have been removed or pulled loose. Often times after learning what was done previously, the mechanic or technician can go right to the problem area and see what happened. This saves LOTS of time! Here are some things to consider when searching for the problem. Did the car have the oil changed recently or does it have really old oil with lots of fuel dilution? Air or fuel filter changed? Was the 30k, 60k, 90k mile Service work done? Any warranty repair work done lately? New tires or new wheels and tires installed? Do the new wheels have the correct offset for your car? Did the car recently switch from using normal performance tires, to using soft squishy snow tires? Were the wheel lug nuts torqued properly with a torque wrench or were they over torqued with an impact gun? Does the car have any aftermarket performance parts installed? Different Camshaft? Modified ECU? Larger Exhaust? New High Flow Air Filter? New Hi-po Spark Plug Wires? Are you using any Fuel/Oil additives? Have you checked the tire pressure lately? Did the car have any body work completed recently? Which Repair shop did the previous repair? Was an aftermarket stereo or CD player recently installed? How about a hands free cell phone installation? New Alarm system? Was there recently a sudden change in outside temperature or humidity? Heavy Rainstorm? (>10%) of alcohol in their fuel? When you were re-fueling at the gas station, was the tanker truck there, dumping a load of fuel? Did the area recently switch to Winter fuel, with oxygenates? Did the gas station attendant pump the wrong fuel into your car? God forbid, Did he pump in some diesel fuel? Did you recently start parking your car outside in the cold and now you have starting problems? Did your driving habits change? Are you now driving short distances so the Car is not warming up properly? Has someone new been driving the car? Any teenagers in your family with a new drivers license? Did you recently hit the curb slightly when parking the car? Good communication with the repair shop service writer or directly with the mechanic/technician to give the history on the car can make all the difference in the world when trying to solve tough problems. Getting good information about a vehicles problem from the vehicle owner or the actual driver of the vehicle is a challenge (especially if your spouse or partner is driving the car regularly). It takes some good detective work by you, the service writer or the repair technician to get the info needed to find the problem. Here are a few questions to ask the vehicle owner/driver, or ask yourself. When the vehicle is first started in the morning? (cold engine), after 10 seconds? 30 seconds? 1 minute of cold running? When the vehicle is started at lunch time after sitting at work for 4 hours? When the vehicle is warmed up, and then started after sitting for 10-15 mins? 30min? Several hours? Does the problem occur when the outside air temp is cold? cool? humid? HOT!? After or During a rain Storm? Does the problem occur at low speeds, when starting from a stop and accelerating? Does the problem occur when the vehicle is driven at a constant speed on the freeway or highway, i.e. when Cruising? Does the problem occur when accelerating hard at Wide Open Throttle?, maybe under light acceleration? What gear is the transmission in when the problem occurs? Automatic or Manual Transmission? Have you driven a stick shift car for long? Is this your first Automatic Transmission equipped car? Does the noise occur when accelerating? Deceleration? When Turning? Left or Right? Sharp turn? or gradual sweeping turn? Has there been any service work or other work performed on the car recently? Driving habits changed at all? New Job? New Home Location? New Husband or Wife Driving the car? Do you have any teenage children who drive the car? Have you owned the vehicle long? (i.e. That button on the dash is for the A/C system to turn on the Compressor to allow the system to cool down the interior). Often times when trying to locate a problem, it often helps to go out with the customer and watch them drive their car, and look for any correlation between the problem, noise, etc. and their driving habits. Problems like, "The car rattles and pings when I get on the freeway". So you go for a drive with the customer and notice they shift into 5th gear at 30MPH and then floor the gas to merge onto the freeway. Constantly Lugging an engine can be just as damaging as constantly over-revving it! Hopefully, you have a new appreciation for the challenges that must be overcome to correctly diagnose, and repair your vehicle. The right combination of Knowledge, Training, Experience, Vehicle History, Appropriate questions, Serious thinking and sometimes a little Luck can make a seemingly impossible job have success!. Many times taking a break away from the problem vehicle for a day or two of quiet introspection can bring the solution to the forefront. Copyright © SJM Autotechnik , all rights reserved. Return to SJM Autotechnik main page.